Thursday, February 4, 2016, 3:29 p.m. to 4:22 p.m.
Pursuant to Standing Order 106(1), the Committee met for the purpose of electing a Chair. Pursuant to Standing Order 106(2), the Clerk of the Committee presided over the election of a Chair. On motion of Marc Miller, it was agreed, — That Hon. Robert D. Nault be elected Chair of the Committee. Hon. Robert D. Nault took the Chair. Pursuant to Standing Order 106(2), the Clerk of the Committee proceeded to the election of Vice-Chairs. On motion of Peter Kent, it was agreed, — That Dean Allison be elected First Vice-Chair of the Committee. On motion of Michael Levitt, it was agreed, — That Hélène Laverdière be elected Second Vice-Chair of the Committee. It was agreed, — That the Committee retain, as needed and at the discretion of the Chair, the services of one or more analysts from the Library of Parliament to assist it in its work. It was agreed, — That the Subcommittee on Agenda and Procedure be established and be composed of five (5) members: the Chair, the two Vice-Chairs and two government members. 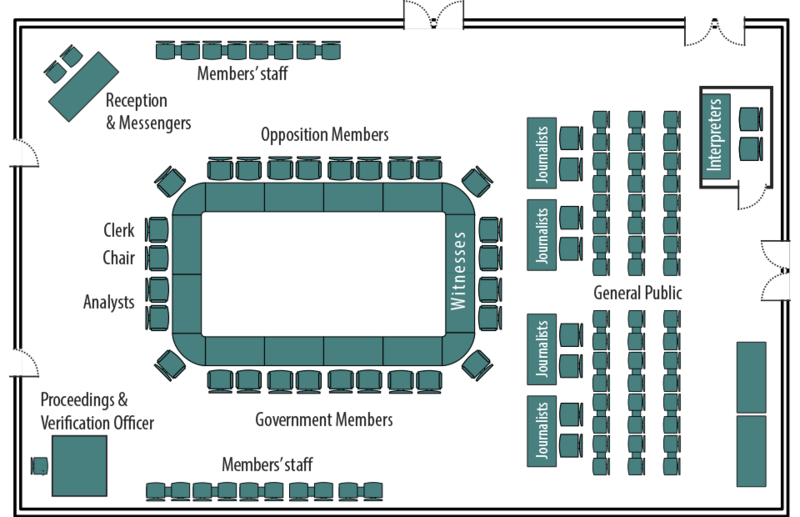 It was agreed, — That the Chair be authorized to hold meetings to receive evidence and to have that evidence printed when a quorum is not present, provided that at least three (3) members are present, including one member of the opposition and one member of the government, but when travelling outside the parliamentary precinct, that the meeting begin after fifteen (15) minutes, regardless of members present. It was agreed, — That witnesses be given ten (10) minutes to make their opening statement; and that during the questioning of witnesses the time allocated to each questioner be as follows: for the first round of questioning, six (6) minutes to a representative of each party in the following order: Conservative, Liberal, NDP, Liberal; for the second round, six (6) minutes be allocated in the following order: Liberal, Conservative, Liberal; followed by five (5) minutes for the Conservatives and three (3) minutes for the NDP. It was agreed, — That the Clerk of the Committee be authorized to distribute documents to members of the Committee only when the documents are available in both official languages and that witnesses be advised accordingly. Hélène Laverdière moved, — That an extra minute be added to the speaking time of the New Democratic Party in the second round increasing the time from three (3) minutes to four (4) minutes. The question was put on the motion and it was negatived, by a show of hands: YEAS: 4; NAYS: 5. It was agreed, — That the Clerk of the Committee be authorized to make the necessary arrangements to provide working meals for the Committee and its Subcommittees. It was agreed, — That, if requested, reasonable travel, accommodation and living expenses be reimbursed to witnesses not exceeding two (2) representatives per organization; provided that, in exceptional circumstances, payment for more representatives be made at the discretion of the Chair. It was agreed, — That, unless otherwise ordered, each Committee member be allowed to have one staff person at an in camera meeting and that one additional person from each party be allowed to be present. It was agreed, — That one copy of the transcript of each in camera meeting be kept in the Committee Clerk’s office for consultation by members of the Committee or by their staff. That, for motions requiring forty-eight (48) hours’ notice, the Chair be authorized to defer consideration until fifteen (15) minutes prior to the adjournment time for the meeting as indicated in the notice of meeting and that these motions be received no later than 4:00 p.m. It was agreed, — That the Committee be authorized to purchase gifts to be presented to foreign hosts and visiting delegations. It was agreed, — That the Committee be authorized to purchase documents for the use of the Committee. That the Chair of the Subcommittee meet with the Subcommittee on Agenda and Procedure of the Committee at their mutual discretion. That, pursuant to Standing Order 108(2), the Standing Committee on Foreign Affairs and International Development undertake a study on Women, Peace and Security; including an examination of the efforts of the Government of Canada to implement and support the United Nations Security Council Resolutions on women, peace and security (including UNSCR 1325 and 1889 on the participation of women in peace processes; UNSCR 1820, 1888 and 1960 on sexual violence in conflict; and UNSCR 2122 on women’s leadership in conflict resolution and peacebuilding); and report its findings back to the House. It was agreed, — That the Chair invite appropriate officials from Global Affairs Canada to appear before the Committee as soon as possible and that they provide members with an update on current concerns within their mandate related to foreign affairs and international development. At 4:22 p.m., the Committee adjourned to the call of the Chair.